WHAT ARE THE BEST ONLINE DOCTORATE IN MARKETING PROGRAMS? What Can I Expect from an Online Doctorate in Marketing Program? Each of us sees upwards of 3,000 advertisements per day, all of which are imagined and managed by those with careers in marketing. The Bureau of Labor Statistics projects the number of managerial positions in the field of marketing, advertising and promotions to increase by 9% between 2014 and 2024. Earning a DBA in marketing online opens a wide range of job opportunities. Not only are job opportunities growing rapidly, the field is constantly advancing as technology creates new avenues for marketing. A doctorate degree in marketing provides the skills and experience necessary to thrive in this diverse and quickly growing field. When choosing your doctorate in marketing online program, consider your lifestyle and existing daily obligations. Think about how many hours per week you can devote to coursework, as well as your specific career goals and how quickly you would like to complete your degree program. CAN I WORK WHILE I COMPLETE MY ONLINE DOCTORATE IN MARKETING? Online programs are designed with the working professional in mind. Because of this, they are much more flexible than traditional degree paths. Many students pursuing online degrees continue at their current jobs while completing their education. The flexibility of online degree programs is one of the most important advantages to earning a doctorate online. You can earn your degree without uprooting your life or leaving your job. Online degrees are typically more affordable than traditional options, and some programs are offered at an accelerated pace to keep costs low and completion time short. Liberty offers a doctor of business administration in marketing program that is ideal for marketing professionals seeking to advance their careers. This 60-credit program prepares students for high-level careers such as sales director, market researcher, and product manager. Coursework in this doctorate in marketing online covers a variety of topics, such as research methods, supply chain management, organizational and executive coaching, quality control management, and strategic thinking for decision-making. Distance learners can earn their DBA in marketing online in just nine semesters. Students are expected to maintain a minimum GPA of 3.25 throughout the program to graduate. Applicants must have an MBA, MS in accounting, MS in information systems, or MS in management information systems with a minimum GPA of 3.0 to be considered. LIberty is accredited by the Southern Association of Colleges and Schools Commission on Colleges. Curricula, required credit hours, program length, and tuition vary by program, but you will find general information about doctorate in marketing online programs below. Although courses vary by school, here are a few courses common to most doctorate in marketing online programs. Ethics in business: This course equips students with an understanding of ethics and social responsibility in business. Covering fundamentals and contemporary and current issues, such as environmental considerations, this course helps students gain an ethical business perspective. Brand and product management: By examining brand strategies, students learn to create a comprehensive management plan and to implement correct practices and methods toward successful marketing efforts. Advertising and promotion: Students apply fundamentals of the communication process toward advertising and promotion strategies. The course covers budgeting, creative strategies, regulations, and social and ethical areas of advertising and promotion. HOW LONG DOES IT TAKE TO GET AN ONLINE DOCTORATE IN MARKETING? DBA in marketing online programs require varying amounts of time to complete. A cohort-based program, in which groups of students progress through the program together, may have a longer completion time. On the other hand, an individually-paced program allows students to complete coursework on personal timelines. Whether you complete your degree on a full-time or part-time basis also affects completion time. Generally, a doctorate in marketing takes three to four years to complete. Most programs require 50 to 60 credits, and many allow students seven years to complete them. Accreditation ensures a school has been recognized as meeting set standards. Schools are most often regionally accredited, and some may be nationally accredited. Regional accreditation is given by the Higher Learning Commission, which accredits schools in 19 north central states. For business and marketing programs, look for accreditation from the Accreditation Council for Business Schools & Programs. The U.S. Department of Education handles policies in the U.S. school systems. The DOE is also responsible for providing aid and assistance to students; you will submit your Free Application for Federal Student Aid (FAFSA) to them each year. The U.S. Department of Education and the Council for Higher Education Accreditation each provide a comprehensive list of accredited postsecondary schools. As more students pursue higher education before entering the job market, employers are increasingly interested in the degree level of applicants. Some marketing positions require graduate degrees. The table below outlines the unemployment rates and median earnings for professionals with various postsecondary degrees. Those with doctorate degrees enjoy lower unemployment rates and higher earnings. Earning a doctorate in marketing opens job opportunities in the fields of business, marketing, and advertising. Professional experience also impacts annual earnings. The table below outlines average salaries for marketing professionals at different stages of their careers. 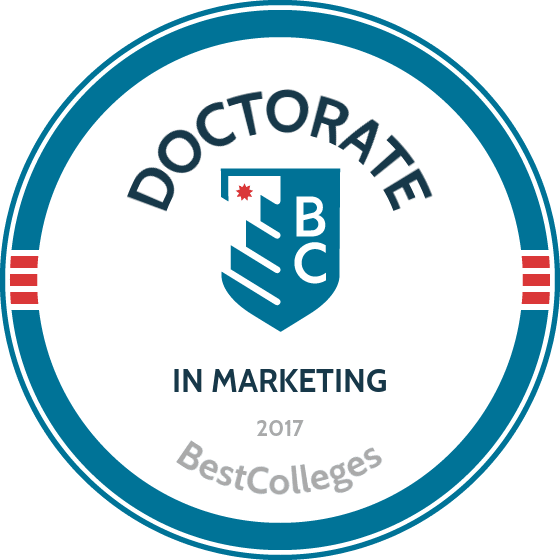 Students earning doctorate degrees in marketing are often driven and determined to succeed, which are valuable qualities for marketing professionals. Below are a few careers options for graduates of doctorate in marketing programs. This position calls for collaboration with art directors, financial staff, and sales agents. Marketing managers develop programs to generate interest in services and products. Professionals in this sales-based position use market trends to predict the performance of products and services. Analysts determine what buyers want and how much they are willing to spend. Doctorate degree holders often remain in academia as professors and instructors. Postsecondary teachers plan and teach courses and perform departmental administrative duties. More commonly known as CEOs and CFOs, these executives ensure a company or organization meets its goals. They create and manage business plans and often serve as the public face of the company. Management analysts optimize the way a company functions. They make their company or organization more profitable by minimizing costs and maximizing efficiency. Professional organizations provide resources to help doctoral students network, find job opportunities, and contribute to the field. These organizations connect graduates with job openings and offer conferences and professional development events to connect members with other marketing professionals. Below are a few prominent professional organizations for those in the marketing field. The AMA examines “best versus next practices” in advertising. They provide content from award-winning journals and sources, including the Journal of Marketing, and connect marketing professionals. The ANA promotes excellence in marketing by protecting the interests of marketers and helping members develop their careers. They offer annual conferences across the country. A network of 200,000 marketers, the DMA educates, connects, and advocates for those in the marketing field. Members receive marketing publications and attend events across the country. Although an online doctorate degree is typically cheaper than an on-campus degree, many students still need financial assistance. Fortunately, many online schools offer financial aid. All online students should begin by filling out the Free Application for Federal Student Aid (FAFSA). Students applying for aid must be enrolled in a program that is accredited by a federally recognized accreditation agency. Students in DBA programs may also apply for program-specific scholarships through major marketing organizations, including large corporations and companies.